Right now, you can get a FREE Subscription to Baby Talk and American Baby Magazine. Babytalk has all the information expectant and new parents want and need from health and safety issues to the latest and greatest products for baby. 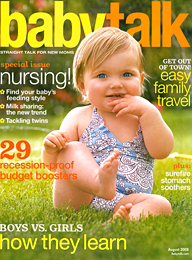 The February 2011 issue of Baby Talk has a $10.00 Amazon Diaper Coupon Code in it! Coupon code expires 02/28/2011!